Firstly, try a hard refresh of the website. Holding down the SHIFT key, press F5 whilst on the website. 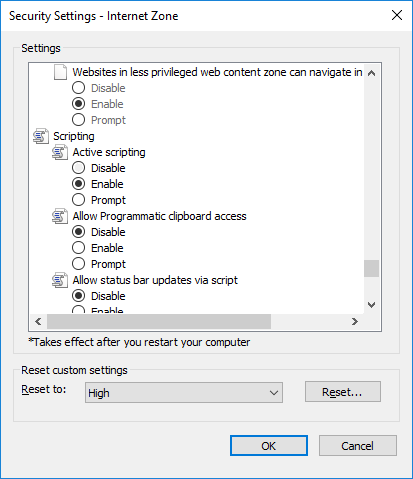 This forces the browser to get the current version of the website from the server. Should the above fail, you may need to clear your temporary internet files from within your browser. This is done differently depending on your browser, see below. Upgrade or install a different browser. Any changes to your computer or mobile device are carried out at your own risk. Read the full Environment Southland disclaimer here. NOTE: the instructions below have been carried out using the latest version of each browser. The location and name of the option(s) may differ in older versions of each browser. Inside Chrome, click on the menu icon at the top right (the three vertical dots). Click the Settings option from the drop down menu. Scroll down to the bottom and extend the Advanced section by clicking on it. Once the options have expanded, scroll down and find the Privacy and Security section. 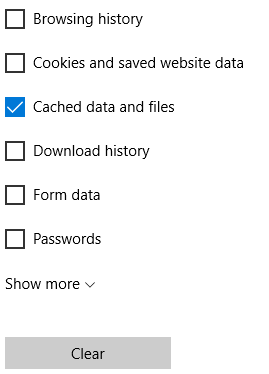 At the bottom of this section there will be an option to Clear browsing data, click it. If you can't see this option, you may be able to search for it in the settings. In the search bar at the top of the options pane, type "Clear Browsing" and Chrome will narrow down the section the option can be found in. After clicking this option a dialog window will appear which contains a few options. We're only interested in clearing the temporary internet files so ensure the only checkbox that is checked is the Cached images and files. If you clear cookies and site data you will be forced to re-login to any site that automatically logs you in. The time range may need to be altered depending on the last time you visted. To ensure you clear the files, select "All time". Browse to http://envdata.es.govt.nz and see if the issue is now resolved. Inside Edge, click on the menu icon at the top right (the three horizonal dots). 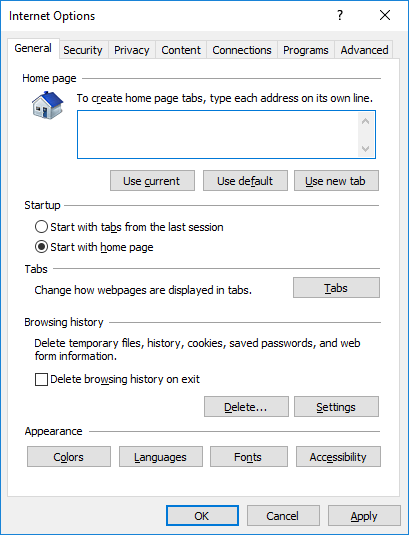 Locate the Clear browsing data option halfway down the screen from the popout menu and click the Choose what to clear button. We're only interested in clearing the temporary internet files so ensure the only checkbox that is checked is the Cached data and files. If you clear cookies and site data you will be forced to re-login to any site that automatically logs you in. Inside Internet Explorer, click on the cog icon at the top right to open the menu. On the General tab, locate the Browsing History section. We're only interested in clearing the temporary internet files so ensure the only checkbox that is checked is the Temporary internet files and website files. If you clear cookies and site data you will be forced to re-login to any site that automatically logs you in. Inside Firefox, click on the menu icon at the top right (the three horizonal lines). Click the Options icon from the drop down menu. In the side menu, click the Advanced option. In the Advanced options, click the Network tab. Press the menu icon at the bottom right (the three horizonal lines). Press the Settings option from the pop up menu. Press the Privacy and Security option. Press the Delete Browsing Data option. 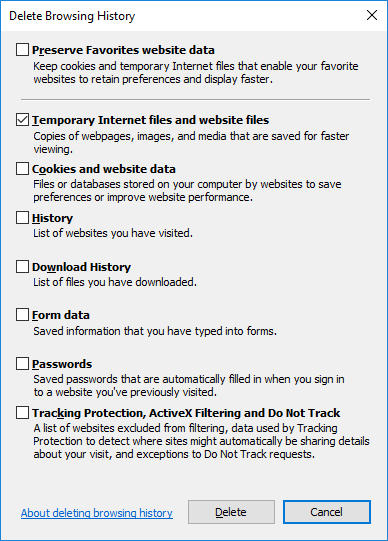 We're only interested in clearing the temporary internet files so ensure the only checkbox that is checked is the Cache. If you clear cookies and site data you will be forced to re-login to any site that automatically logs you in. Press the menu icon at the top right (the three verical dots). Scroll down to the Advanced section and press the Privacy option. 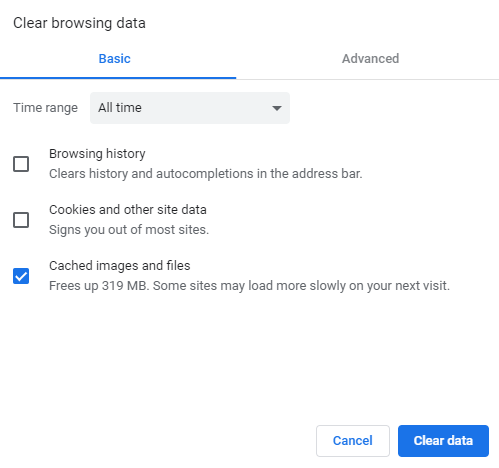 Scroll down to the Clear Browsing Data option and press it. We're only interested in clearing the temporary internet files so ensure the only checkbox that is checked is the Cached images and files. If you clear cookies and site data you will be forced to re-login to any site that automatically logs you in. Read the article at https://kb.wisc.edu/page.php?id=45060 to clear the temporary internet files for Safari version 8 to 10. Read the article at https://kb.wisc.edu/page.php?id=69468 to clear the temporary internet files for Safari version 10+. Locate the Internet Options inside the Control Panel. Scroll down to Scripting section and enable the Active Scritping option. Try to load the http://envdata.es.govt.nz website. Type Internet Options and select the option from the result list. If you're using an older operating sytem than Windows 10, you may need to update or install a later version of the browser you use. The older the operating system you have, the more limitations you will encounter. Most browsers have now ceased support and updates for Windows Vista and XP. Browsing applications you have installed will automatically update themeselves when updates become available unless you've turned this feature off. You can install a different browser by visiting the Play Store or iTunes on your mobile device.